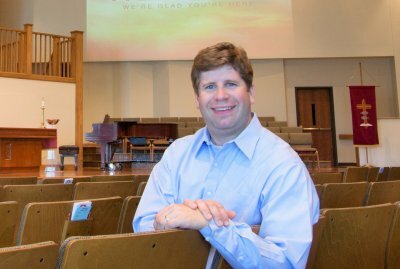 Mark Herris serves as Director of Music Ministries at Calvary United Methodist Church in Brownsburg, Indiana, where he administers a comprehensive program of vocal, handbell, and instrumental choirs for all ages. Calvary is one of the fastest growing Methodist churches in central Indiana and is a vibrant center for music and arts on the west side of Indianapolis. Herris received his Bachelor of Music degree in 1996 from Goshen College where he was an organ student of Dr. Gail Walton. As a student at Goshen he also studied piano with Marvin Blickenstaff and conducting with Dr. Doyle Preheim. He was involved in numerous ensembles and was a Concerto-Aria competition winner as a pianist. In 1998 Mark received a master’s degree in music from the University of Notre Dame under the guidance of Dr. Craig Cramer. He is currently a doctoral candidate at the Jacobs School of Music at Indiana University, Bloomington, where he is studying organ literature and performance with Dr. Christopher Young. Mark has been organist with several professional and university orchestras. He was also a performer for the Organ Historical Society’s national convention in central Indiana in 2007. He has served in leadership roles with the American Guild of Organists and the Fellowship of United Methodists in Music and Worship Arts. He currently lives in Indianapolis with his wife, Christy, and two boys.